Four people were allegedly killed in police firing and a security official was critically injured as a violent agitation for a separate Gorkha state turned the picturesque hill station of Darjeeling into a battle zone on Saturday. Chief minister Mamata Banerjee denied that police fired on protesters but did not say how they died. The Gorkha Janmukti Morcha (GJM), which rules the semi-autonomous Gorkhaland Territorial Administration, said four of its supporters were killed in Darjeeling’s Singamari, where the party’s supporters attacked security forces with bricks and bottles, in one of the worst violence since the flare-up on June 8. TV footage showed forces smoke billowing from tear gas shells and security forces firing from semi-automatic weapons. “Police did not open fire. This is absolutely wrong,” Banerjee said in Kolkata even as she blamed the GJM of having links with militant outfits based in northeast states as well with foreign countries. “There is a terrorist brain behind this hooliganism and vandalism. We have got clues that this has terrorist connections. They (GJM) have connections with underground insurgent groups of the northeast...,” she said. Kiran Tamang, an assistant commandant of the India Reserve Battalion was stabbed on the back with a traditional Gorkha knife known as ‘khukri’ as security forces struggled to contain thousands-strong mobs that torched police vehicles and ransacked government property, shouting anti-government slogans. His condition was said to be critical. Scenes across Darjeeling and nearby Ghoom resembled a battlefield with charred buses, police vehicles and bricks strewn on the road. Officials said Tamang was among 35-odd security personnel injured in the violence, officials said, amid rising concerns that Darjeeling might lurch back to the unrest of the 80s, when hundreds of people died in a crackdown on the statehood movement. The present crisis was sparked by fears Bengali being imposed in schools in the GJM-administered areas where a majority of the people are Nepali-speaking Gorkhas. Though the government clarified that Bengali will be an optional subject, the GJM refused to back down and instead revived the almost 100-year-old demand for a separate Gorkhaland. A raid on the GJM’s office this week fanned anger. Experts see the agitation as the GJM’s efforts to revive its political fortunes after the Trinamool made history by registering its first victory in a hill municipality in Mirik. GJM president Bimal Gurung, who is in hiding, issued a video-message asking all Gorkhaland supporters to “give a fitting reply to what West Bengal government did”. The GJM also called a 12-hour shutdown on Sunday in the Dooars, a region straddling three plains districts, posing a fresh challenge to the Trinamool government. 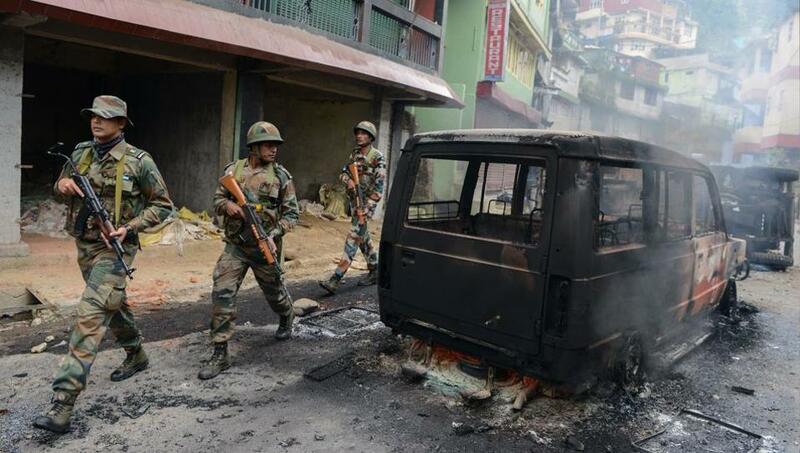 An indefinite shutdown is continuing in Darjeeling and Kalimpong districts. The GJM ruled out any possibility of talks with the Mamata government, saying it will only negotiate with the Centre. The BJP is an ally of the GJM. Mamata offered to hold a dialogue if the GJM called off the shut down, that has paralysed the region’s money-spinner tourism industry. Hundreds of tourists have left the hills since the violence started. The chief minister, who saw a “deep-rooted conspiracy”, also announced an all-party meeting on June 22 in Siliguri to discuss the issue. Union home minister Rajnath Singh spoke to Banerjee on Saturday, officials said in Delhi. Gorkhaland Movement - Four people were allegedly killed in police firing and a security official was critically injured as a violent agitation for a separate Gorkha state turned the picturesque hill station of Darjeeling into a battle zone on Saturday.